Directions from Asheville (to take-out): I-40 West to the first TN exit (Exit 451, Waterville). Turn left at the bottom of the ramp, pass under I-40, follow the road over the bridge, and then turn left and head upstream to the parking area at the confluence with Big Creek. Shuttle: Return to I-40 and head east to the first NC exit ( Exit 7, Harmon Den). Turn right off the ramp onto the road heading to the river. Put-in below the low water bridge. Other access points: An alternate put-in from a service road by-passing the first tunnel as you head upstream was by barricaded by the highway patrol the winter the surge tank blew out. Use it if you must (the distance and gradient is listed below), but the highway patrol would prefer you put-in below the low water bridge at the Harmon Den exit. The three miles of semi-flat water you will paddle are pretty and build character (and if you are a typical paddler you no doubt need all the character building you can get . . .). Camping: If it is open and you can snag a spot, the Big Creek campground in Great Smoky Mountains National Park is a couple miles up the road from the take-out. There are only twelve campsites and they're very nice, so they're in high demand. Another option is the campground at Cataloochee, which can be reached from both the road over the low-water bridge at the put-in and a right turn off the road from the take-out to the Big Creek Campground. The Cataloochee campground is a little larger (twenty-seven sites), so the odds of getting a site are a little better. Also fairly close is the Cosby campground, which is much larger than either the Big Creek or Cataloochee campgrounds (175 sites). All three campgrounds are open from mid-March to the beginning of November; the Big Creek and Cataloochee campgrounds are $12 per site per night, and the Cosby campground is $14. For more information visit the NPS's Great Smoky Mountains Camping Page. Maps: MapQuest Map (the star is located at the put-in) Re-center on the star and zoom in for a good look at the shuttle and the roads to the Big Creek and Cataloochee campgrounds. The Pigeon River Dries are the normally waterless stretch of river upstream of the Pigeon Gorge play run. Unlike the run just downstream, the Dries are quite creeky with all the associated hazards this entails plus a few extras contributed by jagged rocks loosened by construction of I-40. The Dries almost never run. Almost never run most years, that is; November 2000-May 2001 was different. The surge tank feeding the Walters power plant underwent repairs, and for almost this entire period the Dries ran. This meant that a run that at one time had been done by only a handful of boaters became very well known. Alas, the surge tank has been repaired, and with the exception of periods of extraordinarily heavy rain, the Dries are dry once again. The Dries have been run very very high (by Tom Visnius and Corran Addison), but for mere mortals the run starts to get very pushy around 1,500 cfs. At higher mortal flows all but the two hardest drops (No Where to Land, which features a shallow, rock-laden landing zone and a severely undercut left bank at the top of the main drop, and Chinese Arithmetic, the longest rapid on the river and the only rapid to have claimed a life) are IV's or IV+'s, but as my friend Tom Piccirilli said of the IV+'s, "they're IV's, but they're 4.9999's." In addition, a swim could be nasty as some of the rock is jagged and in places the action is continuous. In April 1994, Tom Visnius and Corran Addison did a BIG water run in the Dries. Corran had done the run at lower levels (two feet over the low-water bridge at the Harmon Den exit) but it was Tom's first visit. The river was flowing NINE feet over the bridge (the water was all the way up in the big flat spot between the highway and the bridge). This corresponds to 3000 cfs. Tom wrote an account of the run for the Western Carolina Paddlers newsletter [see below]. Corran and Tom (for the first time) were both paddling a new boat that Corran's new company had just released . . . the Scorpion. Some of the folks who had driven out with Corran and Tom ran Upper Big Creek instead. We meet Corran and Tom in the Big Creek parking lot. Both boyz were highly animated. Corran described a typical rapid as being like running the Upper Gauley's Pillow Rock, followed by Sweet's Falls, followed by Iron Ring. Both Corran and Tom told tales of thorough trashings in monster holes. Tom described being stuck for "a long time" in one hole, finally washing out directly into a second hole, and then washing out and just making a must-catch eddy before a scary drop requiring a careful scouting. Most of us would probably prefer the Dries at lower levels. Here's Tom's article as it appeared in the May 1994 edition of "Messing About," the newsletter of the Western Carolina Paddlers. At 1am, Saturday, April 23rd, I called my friend (and new WCP'er) Philip Curry, and suggested that we run Big Creek in the morning. We headed for the Park a few hours later, knowing that it could take all day to hike up and then paddle down. I also called my friend Mark and invited him to come out and watch the brave hairboaters and, if he was lucky, paddle the lower section with us. It was not long before fellow WCP'ers Gregg Merchen, Karen Craft, Jim Sheppard, Chris Bell and Corran Addison showed up. Not among them were Mark and his car pool, so Phil and I had to decide whether to paddle in a fairly large group with two paddlers who had not run Big, get ahead and stay ahead, or paddle with Corran. Corran had copped some big air snowboarding only a week previous and his lower half was still recovering from yet another encounter with fickle inertia. His idea was to run the Dries of the Pigeon, which, as Phil and I were giddily aware, was stomping down from Walters Dam at a respectable flood-like pace. We observed on our way up to the campground that there come situations that require us to step away from our routines -- an unknown river in flood fell into that category. Maybe it wasn't flooding. I don't know; I had never run the river before. Maybe it was merely breathing deeply after a claustrophobic winter in Haywood County. Perhaps it was stretching its limbs for the long parade down to Newport. Most likely, we happened to be in the area when the folks at the dam decided to release some extra water. Someone said that it was running 9 feet and 3000 cfs. Corran said that nobody had run it above 2 feet. I said that all that water should have diluted the abnormal burning stench that has given the Pigeon its international reputation. "Big Holes!" "Gnarly!" Words like these were included in Corran's description of the Dries. Of course, he hadn't seen it above 2 feet, but he did know the gorge well at lower water. He was in no shape the five-mile hike up Big Creek, so he was trying to gather interest in a nice, highway-accessible jaunt down a river with more water in it than rocks. The contrasts are distinct between Big and the Dries. First, there is the difference between the pleasure of huffing your tub up a steep creek for five or more miles, and the convenience of driving on Interstate 40 for five miles. Then there is the difference in scenery. The Dries are not exactly like paddling in a ditch behind Wal-Mart. In fact, I seldom noticed the highway, which, being controlled-access, limits the amount of pedestrian pollution that a paddler is likely to come across. For the Lewis and Clarke wannabes, however, the Dries has more than its share of road debris as a result of the eight-lane highway carved into the gorge. Big Creek has an old railroad grade cut into its banks, but time has smoothed the scars, so that one seldom notices it, save for the hikers, horse-riders, and fishermen who frequently use it. Which is more remote? Which is more private? It would depend on what you choose not to look at. There is a predictable difference in scenery. The Dries has many wide views of the gorge walls, due to the width of the river. Big Creek is close and, at times, confining. It is scenic elysium to paddle amongst the grand flora of Big, but sometimes that flora can barricade the river and leave you either hoofing or swimming. There are other differences, too. Namely water quality, quality of the water, and, of course, WATER PURITY. 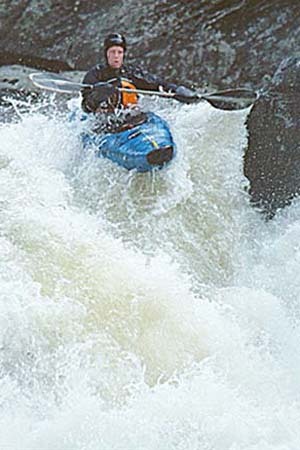 I have never paddled a river, even a smelly one, that has left my mucous membranes burning for hours after I took-out. SIX HOURS. And what is it, exactly, that is in the water to cause such a reaction? Big holes! The Dries is home to the best whitewater in Western North Carolina! Among the bigger rivers. South of the Linville. In flood, anyways. For a flood stage river the Dries easily compares to Section IV at flood. There were pools, and eddies, and beautiful surfing waves. But when it comes to steering a boat through the thick of the big rapids, a paddler should be prepared to swallow some chemically aggressive whitewater in any of the countless throbbing giants that adorn the Dries. Every rapid does have a line through it; this is a general boating philosophy. But there are holes in the Dries, and no matter the level, there will be something in them that will lead the intrepid paddler's eyes, nose and throat to respect where those babies once were. According to Corran, the Dries are split into three gorges. You can call them bends or rapids, but they are gorges. Gorge one is a good warm-up. I say this because I don't remember the first thing about Gorge One, except that what follows is Gorge Two. Gorge Two is loaded with challenging whitewater, and it contains the very special "Stairwell to Hell." It is easily spotted thanks to its distinct horizon line. There was supposed to be a pile of rocks at the base of the center drop.That day, the drop resembled Sweet's Falls, but with an aggressive looking hole at the base that resembled the hole in Tower on the Russell Fork. That hole is clean, isn't it We sneaked to the right, and then wove our way through a Golf Course of Gigantic Holes. Each hole looked like a good ride in and of itself, but it is best to proceed with caution. There are plenty of good times eagerly awaiting the tired, choking, blinded paddler further down Gorge Two. One of these is called "No Place To Run." At nine feet, just shoot from right to left, like in Iron Ring. But, again, it would be best to avoid the massive lung mashers to either side of the theoretical preferred line. Gorge Three is a lot of fun. With the proper hazmat suit, I could be tempted to play in Gorge Three at any level. It is really fun, but not entirely challenging. Think of it as a way to expose yourself more completely to the caustic soda of the Pigeon, until you reach the Waterville powerplant and the sparkling, crystalline waters of Big Creek. Yes! Back to nature. Ask the owners of the private property along scenic Lake Logan why they didn't build their park just downstream of the Champion paper mill. It's a beautiful, clear lake built on the West Fork of the Pigeon, about six miles upstream of Canton. Ask them how they like the water quality. Ask them if that's where their slalom kayaking friends train. Ask them what would cause a paddler's entire face to burn after running the Dries of the Pigeon. I don't know who they are, but I suspect the folks at Champion International Corporation, (704) 646-2000, might know.